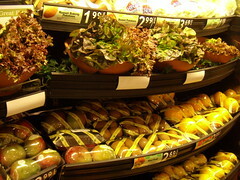 Organic produce display at Food Lion. 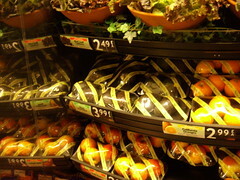 They have stickered apples in plastic wrapped trays! I bought organic apples, strawberries and kiwis last night. I grabbed an apple this morning. In order to grab an apple, I had to open the plastic wrapped tray of three apples. I pulled one out and put it in my lunch. Then at lunch, I discovered two stickers on the apple saying, “Hey, I’m organic.” I took off the sticker and it left all this goop behind. What the frog! Why? Why! First, wasteful packaging to gather up three in the first place. Then, to add insult to injury, they put on a sticker that is about impossible to get its residue off?